Nepal 'chaos' for quake rescuers Jump to media player Rescue teams in Nepal have been making their own way into badly affected areas to find and treat survivors of the earthquake. Rescue effort gathers pace after quake Jump to media player International aid supplies are being distributed in Nepal after the earthquake struck four days ago. Faint tapping leads rescuers to woman Jump to media player The BBC's Clive Myrie is with an international search team in Kathmandu as a woman called Krishna is pulled alive from the rubble of a building destroyed in the Nepal earthquake. The struggle to get aid to Nepal Jump to media player Aid for those affected by the central Nepal earthquake has been pouring in from around the world, Jennifer Pak went to a warehouse in Malaysia to find out how their hub is working. A recovery operation is still under way at the world's highest peak, Mount Everest. Saturday's earthquake in Nepal caused rock slides along popular trekking trails, and an avalanche killed 19 climbers. 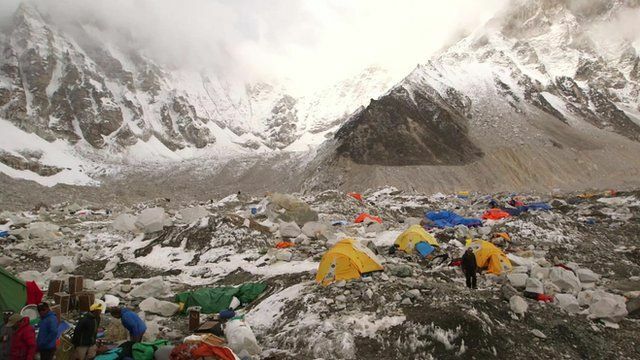 The BBC's Ian Pannell reports from Everest Base Camp.